Please tell us about your own pet(s) and what they mean to you? I have a two year old Jack Russel cross Yorkshire Terrier called Poppy. The worst part of my job as an MP is every Monday morning and having to leave her to travel down to London. The fact she knows I’m leaving and does her uptmost to make me feel guilty about it just makes heading to London so much more harder. You've already involved yourself in other pet welfare issues. How did you first become aware that pet theft is a (rising) crime and why you decided to do something about it? 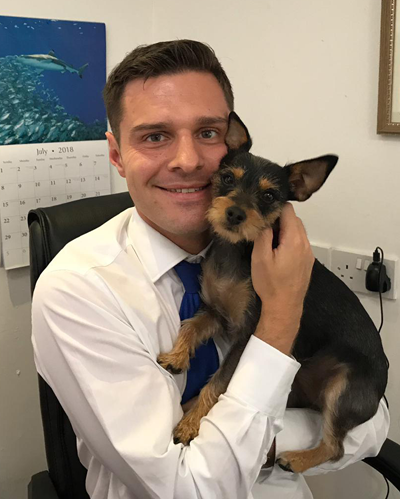 Since being elected to Parliament in June 2017 I have been involved in a number of Pet and animal welfare issues. I have campaigned to ban the use and sale of electric shock collars, for the introduction of Lucy’s Law, for the introduction of Finn’s Law, for action to deal with puppy smuggling and for tougher sentences for Animal cruelty. I was made aware of the growing issue of Pet Theft during the campaign I was running to ban the use and sale of electric shock dog collars. Dog owners who had suffered the distress of having their dog stolen contacted me to share their stories which were truly heart-breaking. Last year, 61 French bulldogs were stolen – a 27% rise year on year, while Staffies remain the most targeted dog with 210 stolen in 2017. I came to the conclusion that a change in the law could have a significant impact on these figures. Pet and horse owners are often very surprised to find out that their animal family members are legally regarded as objects when it comes to theft.What changes would you like to see amended into the 1968 Theft Act? Pet theft can cause lasting damage to a family, more so than the theft of an inanimate object of the same sort of financial value. Or consider the case of Kieran Hamilton, who was stabbed 40 times in a burglary in which his dog Rambo was stolen. According to his mother, he just wants his dog back. As it stands, the law does not properly recognise the real harm that pet theft can cause, because pets are not inherently treated differently to inanimate objects. In England and Wales, sentencing guidelines are based primarily around the financial value of the possession, whether it be a mobile phone, a TV, or a beloved family pet. When Dawn Maw, who described Angel as her “best friend,” said that “my phone might have cost the same as Angel, but could have been replaced within 24 hours,” she got to the heart of the absurdity of this situation. 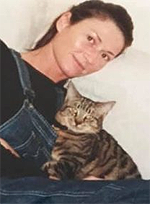 Victims of pet theft have not just lost a financial asset; they’ve lost a much-loved member of the family. Pet theft can be a truly devastating and distressing experience. Losing a Pet can tear the heart out of a family. And that is what the law should, but doesn’t, recognise. Can you explain briefly what a Private Members' Bill? Can you give us a summary of your Pets (Theft) Bill proposal? Your Bill considers pet theft as an animal welfare issue. This is different crime than a theft issue? No, but current criminal law relating theft is not adequate in recognising the significant and emotional role that our pets play in our lives compared to a mere possession. For many people, it can be hard to truly comprehend the impact that losing a pet can have. These animals are an integral part of the families that look after them, or indispensable companions to those who may live alone. As things stand, the law does not recognise a pet as being any different to any other inanimate possession of the same value. But a pet is not something you can simply replace. You had your 1st reading in the House of Commons on the 3rd July, 2018. How did this go? The first reading of my Bill went well. It was an opportunity to raise awareness of the issue of Pet Theft amongst other MPs who were able to show their support for the Bill by being present in the Chamber. I also needed to demonstrate that I had cross party support for my Bill by obtaining signatures from other MPs which I am pleased to report I found very easily. What is the process now for you to further your Bill? Having now introduced the title of my Bill the next steps are that the Bill is published as a House of Commons paper for the first time. The next stage is second reading, which is the 23th November (now postponed to allow more time for the government to look at the details) which is the first opportunity for MPs to debate the general principles and themes of the Bill. Finally, have you met any victims of pet theft and if so has it made you more determined to amend the law? During the course of my campaign I have met several victims of Pet Theft, I have heard the distress and upset in their voice, I have had people cry because the to this day have no idea what happened to their pet, if they are ok or if they are even still alive. I have seen and heard at first hand the devastation that pet theft causes. It shows how clearly abhorrent the crime is. How truly wicked it is. Having heard these experiences and reflecting on how I would feel should such a horrible thing happen to me it has made me incredibly determine to bring justice to the victims and send the clearest possible message to these criminals. Police crime figures updated and there's not much to purr about! The 2018 data is now in and it is showing that recorded cat theft has risen by a shocking 34% in the past year, making the overall increase 114% since 2015. The big question is: how much of this increase is due to some police forces upping their game by recording these crimes and how much is it a reflection of the cat theft picture? Why the need for a Cat Theft Report? 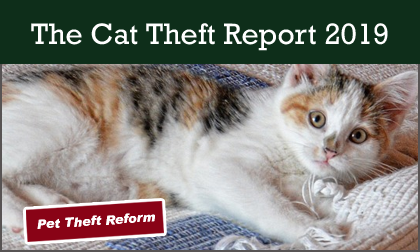 Very little primary data has been gathered about the extent of the theft threat for cats and our feline companions were being left out of the debate as a result. It seemed to us that if we were ever going to be able to sharpen our claws when it comes to legislation this needed urgent addressing.